1) My primary objection is that, given the way the potential uses for the tax are described, this ballot measure will extract far more revenue from Albany than will ever be returned to us in the form of shoreline enhancement grants. Most of the money will be used to restore wetlands in the South Bay (see item six here). Note: If you are skeptical of this information because it comes from a politically conservative site, here is an objection from the center, and here is one from the left (you have to scroll down). At the Albany City Council meeting on June 6, starting at 6:00 p.m., the council will review the latest plans for the Albany Bulb restoration. The 143-page document describing the options will be available soon on the city website. I think this is an excellent plan, and I wish we had more funding to implement all of the suggestions. But we don’t. That’s why I’m opposed to shipping Albany’s money to the South Bay when we have a shoreline enhancement project right here that could use the money. If you like the idea of restoring wetlands many miles away from Albany, I’d encourage you to donate to environment organizations to support that goal. But as your city council member, it’s my job to protect the interests of Albany and its residents, and I don’t think Measure AA is in our interest. I’m relatively aware of the remote corners of the Bay Area because I spend a good part of my weekends cycling through northern Sonoma County, eastern Alameda County and other spots far from the Bay. Just a few weeks ago I was driving back from a ride near Hopland, in Lake County. As I crossed the county line back into Sonoma county north of Cloverdale, I was still almost 60 miles from the closest part of the Bay. Yet under Measure AA, the owners of land there would be assessed a $12 annual parcel tax. That’s the same amount as in the wealthy South Bay residents of Atherton, Palo Alto, Los Altos Hills and Menlo Park. It’s the same amount as major Silicon Valley corporations with low-lying properties near the Bay. These businesses will gain from Measure AA for a trivial portion of their annual profits. You can compare the incomes of these wealthy South Bay cities to those of places like Cloverdale or Gilroy here. Many of the residents of the nine-county area live more than 30, 40 or even 50 miles from the Bay. Some of them live in coastal areas where sea-level rise will come not from the Bay, but from the Pacific Ocean. It’s bad enough that here in Albany we have to rely on regressive parcel taxes to fund our local schools and other community services. But at least in our small city there is a reasonable degree of economic homogeneity, and a strong sense of shared community purpose for our schools and other services. 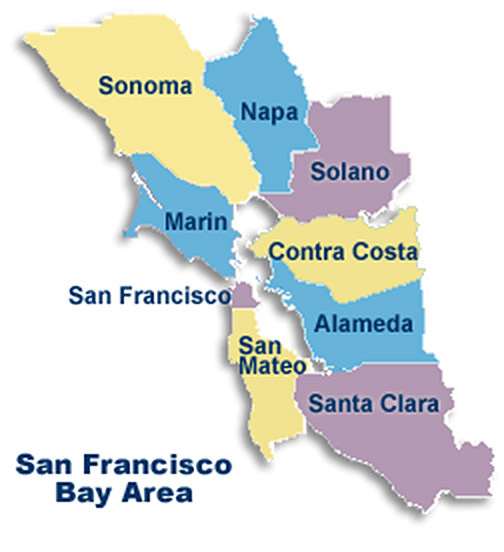 But that is not the case for the nine-county Bay Area region. If wealthy Silicon Valley communities and businesses want to enhance their shorelines and protect them from flooding, there are far more equitable options. One example is the assessment district, which can apportion the tax in a way that is consistent with the degree of benefit. 3) At at time when the mechanisms of a Bay Area regional government are still being contested, Measure AA is a preemptive strike that creates a precedent that regional government will be by and for Silicon Valley elites. I suspect that many people reading this have no idea that the government agency that put Measure AA on the ballot, something called the San Francisco Bay Restoration Authority (SFBRA), even exists. The governing board of the organization was appointed, not elected. To be fair, some of the board members are elected officials. However, they are charged with representing citizens who were not able to vote for them (or vote them out of office). For example, on the SFBRA board, a Napa County supervisor represent all of the four North Bay counties, although he is not an elected official for the citizens of Marin, Sonoma and Solano counties. Here in the East Bay, someone you may never had heard of, Contra Costa Supervisor John Gioia, represents Alameda County as well. No one in Alameda County has ever voted for John Gioia. To my knowledge, Gioia has never made an attempt to contact the City of Albany to explain his role on the board of SFBRA as our representative. The Measure AA ballot language states, “An independent citizen’s oversight committee will oversee funds to ensure they are spent properly.” However, the fine print reveals that this oversight committee has no authority, will be appointed by the SFBRA board, and is charged with publishing an annual report for the board’s website. And while we are looking at the fine print, Section 5.A. of the measure’s full text states, “The Governing Board of the Authority shall be empowered to amend this Measure by a majority vote of its members to further the purposes of this Measure…” Hmmmm. 4) From my perspective as a university science editor, Measure AA appears to be pretty dubious. Although some news outlets have characterized Measure AA as a tool to fight climate change, the words “sea-level rise” or “climate change” never appear in the ballot language. The rebuttal to argument against Measure AA refers to the Bay Institute and the Nature Conservancy as “preeminent scientific organizations.” No, no, no. The National Academy of Sciences or the American Association for the Advancement of Science are examples preeminent scientific organizations. The Bay Institute and the Nature Conservancy are advocacy organizations, and good ones, but they are not preeminent scientific organizations. The argument in favor of Measure AA states, “Fish in the Bay are contaminated with harmful chemicals like PCBs, mercury and pesticides.” Uh, there’s a problem with that statement. Did they mean to write “mercury compounds?” Mercury is not a chemical, it’s an element. It is a member of the periodic table of elements (it’s one of only two elements that are liquids at room temperature). The fact that these Measure AA advocates have little command of basic scientific information raises a red flag for me. For background on the scientific and engineering complexities of Bay restoration, please see this statement by UB Berkeley professor emeritus of environmental and civil engineering James Hunt. When I head out to the Albany Shoreline, I can see straight out to the Golden Gate. If I scan to the right and left, I don’t see any obvious wetlands (maybe I need binoculars). The emphasis on restoring wetlands in Measure AA won’t help Albany. Nor will it protect much of our critical infrastructure, like the ports of Oakland and San Francisco, our two airports and other urban spaces near the Bay. A better and more thoughtful approach would be to start with the high sea-level forecasts for the year 2100 and realistically assess what we can do between now and then to practice effective triage. Some land and structures we can save. Some will slip under the rising water of the Bay. By 2100, wetland restoration may be a very small part of the problem. To summarize, I don’t think Measure AA is in the interest of Albany, it uses the wrong taxing mechanism, it hands taxing authority to an undemocratic regional authority, and I think it’s on shaky ground scientifically. Measures B and E are the two general obligation bonds that, if passed, will fund renovations to Albany schools. Measure E is the smaller of the two, and will basically be used to rebuilt the old McGregor school site, across Brighton Street from the current middle school. According to the ballot language, it will impose an annual bond repayment of an estimated $60 per $100K of accessed value for 20-30 years, and will require and 55 percent majority to pass. Measure B will basically rebuild Ocean View and Marin elementary schools. It will impose an annual repayment twice the size of Measure E, $120 per $100K of assessed value. Because of its size, it requires a two-thirds approval rate by the voters. I have been aware of the size of these bonds for several months, but I didn’t feel it was my place, as a former school board member but a current city council member, to initiate a discussion about them. The information about these bonds for Albany voters has come very late, and I’m not impressed that the voters are getting an accurate perspective on them. I’m encouraging you to vote in favor of Measure E. It is a different animal than B. Measure E will take a site that is not currently useful and build new classrooms there. It solves an immediate overcrowding problem. It will only require 55 percent voter approval, and for an Albany house with a $600K assessed value (like mine) it will add $360 annually to property tax bills. I can live with that. Measure B is a different beast. It will tear down two existing, functional schools and (after several months), will replace them with two new schools that will be built to current Division of State Architect (DSA) earthquake and other safety standards. Many parents don’t realize that around 2004, back when I was on the school board, Marin and Ocean View were refurbished and brought up to DSA standards. These schools no longer meet current DSA standards, not because they have become less safe, but because earthquake safety standards have gone up since then. Earthquake safety standards typically evolve over time as information from recent earthquakes gets added to building codes. It’s similar to the decision a family makes about buying a new car. The old one still runs fine, it’s got a few years left in it and it still passes its smog tests. A newer car would be expensive, but it would be more modern and would have better safety features like more advanced air bags. You have to weigh the pluses and minuses and make a choice. Keep in mind that for earthquake safety, the most important room is your child’s life is not their school room, but their bedroom. That’s because your child typically spends at least one-third of their life sleeping in their bedroom (not to mention play and study time). By comparison, one year is comprised of 365 days x 24 hours, or 8,760 hours per year. As an example, if your child attends school six hours per day, five days per week and 40 weeks per year, that is 6x5x40 or 1200 hours, or less than 14 percent of their lives. That’s why earthquake safety training stresses that the odds are an earthquake will occur when you are in bed. Our school staff and board members would counter that while that may be true, the school district can’t go around upgrading earthquake safety standards for every home occupied by every one of their students. But they can make safer the places where several hundred students will be gathered in case of a big earthquake — their classrooms. How many of you remember the color of the walls of your school when you were in first grade? The reason I ask is that I think improvements for schools are often done “for the sake of the kids,” when I think it’s grown-ups that care about how infrastructure looks. Kids care more about intangible, human interactions. Good friends, good teachers, freedom from bullies, etc. Will Measures B and E address those? Maybe not so much. From my office on the UC Berkeley campus, it’s an easy walk to the new stadium complex, which was rebuilt in part because it sits on the Hayward fault. The new stadium is a stunning, expensive white elephant. It’s a great place to watch a football game and wine-and-dine wealthy donors, but the debt service on the stadium and other earthquake-related rebuilding is killing the campus. I don’t want to see our town make the same mistake. Let’s assume Measure E passes. My property tax bill goes up by $360 annually. If Measure B passes as well, my property tax bill goes up by $1,080. Gulp! That’s real money, especially since I am planning on retiring in another year. For young families who have just moved to Albany, the assessed value of their house is the sale price. Almost any three-bedroom, two-bathroom house in good condition in Albany is going for $1 million. In that case passing both measures B and E will add $1,800 to the already high property tax bill of a new Albany family. And it will add several hundred dollars to the property tax bill of seniors and low-income families, since no exemptions are allowed on general obligation bonds. Marin and Oceanview schools have some life left in them. But sooner or later, probably within a decade, the schools should be replaced. One option is to pass Measure E, let the school district get to work building out the McGregor site, and have Albany parents monitor the success of that project. That should give parents a basis for a more informed decision in another year or two. On the other hand, construction costs typically keep rising (unless there is another economic crisis), so not passing Measure B now could mean higher constructions costs later. So if you trust the school district, vote in favor of Measure B now. Either way, you are rolling dice. It depends on what sort of bets you are willing to make. I wish I could say something more definitive, but there are no easy answers here.